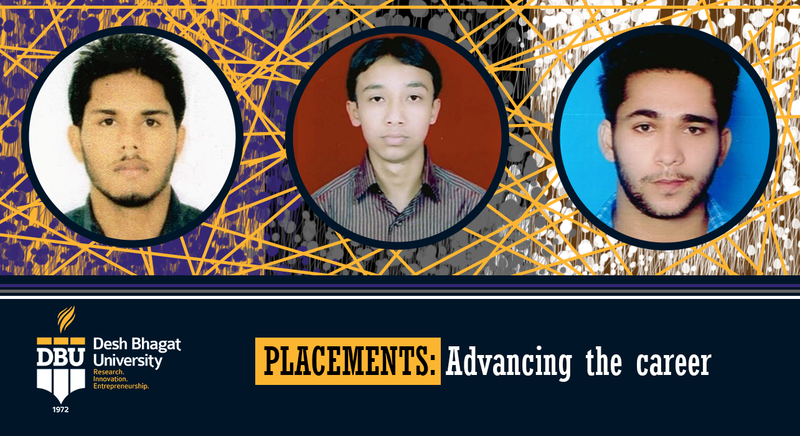 Four students of Desh Bhagat University have brought glory to the institution by getting selection in well known software and other companies on different posts with handsome salary package. Giving details about the selected students, university Pro-Chancellor Ms. Tajinder Kaur informed that Sanjeev (MCA Final year student) from Faculty of Computer Science and Applications has been selected as Project Engineer by Wipro Technologies through Joint Campus Placement Drive. Another student from Faculty of Engineering and Technology Arif Hussain (B. Tech, ME) got selected as Trainee Engineer in Metro Tires. The selection process consisted of online test, presentations by the company representatives followed by group discussion & personal interviews. She also informed that two more students from Faculty of Engineering and Technology have been selected in Technospecs Technologies. After rigorous rounds of selection, this software company selected Komma Khyati Reddy as Software Trainee and Avinash Raj as Embedded Developer for Mohali location. While congratulating selected students, university Chancellor Dr. Zora Singh said that they are proud of them and encouraged the students to work with full dedication. They also appreciated the staff for their dedication and commitment to duty. Vice Chancellor Dr. Virinder Singh also congratulated the selected students and said that it is the result of the able guidance and hard work done by Training and Placement Department of the university, teachers as well as the students. The students who were in a jubilant mood gave the entire credit for their success to the highly committed teachers, state-of-the-art infrastructure and congenial academic environment in the university. Directors of different faculties and staff members wished the students a bright future. It merits mention that the university has tie-ups with reputed national and international companies and organisations to ensure best training and placement prospects for its students.